Recently engaged? Congratulations! Once you’ve shared your exciting news with family and friends, the first question you'll be asked is, "when's the wedding?" 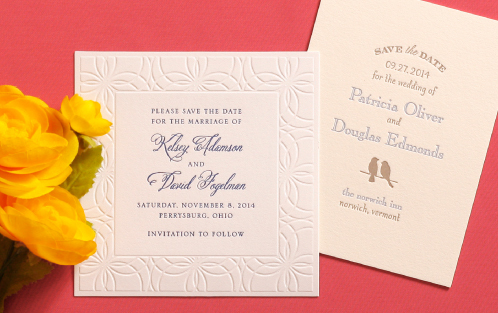 Save the Date cards inform your guests of your future plans while setting the tone and style of your day. These should be sent four to six months in advance (or up to 12 months for destination weddings). 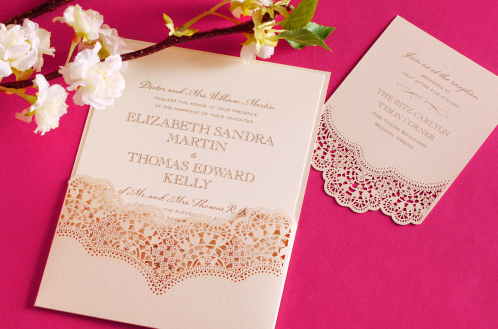 Since lace is both a wedding tradition and a ubiquitous fashion trend this year, we’re loving the idea of using the smaller, Opal Lace Edge card (above) as a Save the Date. It sets the tone for an elegant affair so perfectly! The Opal Wedding Lace Pocket with Ecru Wedding Invitation - from the same collection - further affirms the sophistication of your style as you unfold the details leading toward your wedding day.